?Entire steel frame structure, high temperature to make the frame regain the same steel feature of high strength, ensure the bed undeforable. ?Gantry movement style structure, scientific and reasonable table design. Optional automatic oil lubrication system, free maintenance. ?The machine bed is precisely processed mechanically, servo driving system of Japanese brand. Optional ATC with the highest control system from Taiwan. 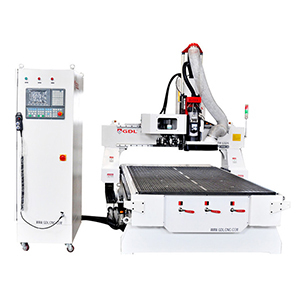 ?The X-axis and Y-axis are transmitted by the imported gear and rack with high precision. Running more stable and quiet with high speed and great power. ?The Z-axis is driven by the ball bearing screw rod with original screw nut of European brand. Its travel is up to 220mm..
?The large-scale straight-liner square guiding track is imported from Taiwan with high steel feature. ?Vacuum and adsorption working table, big flux vacuum pump. 1.Wood processing, furniture spare parts processing. 2.Abnormity cutting of the plate offfice furniture. 3.Relief sculpture processing of archaizing woodwork, free-painting door and wooden door processing. 5.Acrylic plate processing,relief scuplture wooden lines. 6.Wooden decorative spare parts processing. 7.Man-made marble,high density plate cutting.